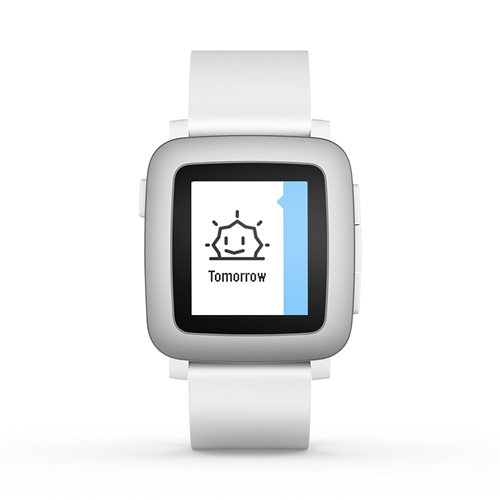 Pebble supports many languages and character sets. A Gorilla Glass face and stainless steel bezel help maintain durability. Watch Crystal Material Glass. Dial Shape Rectangle. Weight 1.5 oz / 42.5 g(Watch and Band). 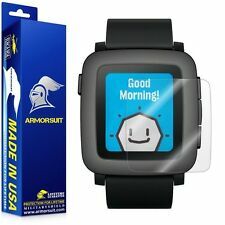 The Pebble time is a fantastic smart watch with 5 - 7 day battery life as opposed to the Android and Apple smartwatch's that last less than a day. The health tracking is the main reason I bought it. I got fed up with having to remember to start an app every time I went for a walk. The Pebble Time software automatically tracks my steps and sleep and I have it tied into Google Fit for very comprehensive fitness tracking. It works like a dream and it's all automatic which I love. This product is well worth the investment, worth every penny! Sold as new for Premium Price... It's not. Sold as new for a premium. It is not new. There are subtle dings around the edge. Overall though, works fine and I am satisfied. Love it for what I need it for. Time, telling me if if I have a text or call coming in I dont have to carry my phone all the time. Its also tells me notifications of emails that I have received. Hooked up great with my Samsung 7. Battery life is great. It was kind of tricky getting it all set up, since I am technically challenged when it comes to computers, blue tooth and such. I did managed to get it synced with my iPhone without any help from anyone. Yay me! I really like it.